Create a safe environment for both personnel and products. Each model includes two bollards, two 127" long chains and one DCBB-B-KIT. Highly visible safety yellow finish. Quick installation or removal thanks to the bolt-on chain hook-up. Chains are mounted at 21" and 42" high on the bollard. Chain can be cut to size upon request. To convert your existing bollards, just drill holes for mounting and use the Conversion Kit and Steel Powder Coat Chain (each sold separately) to complete your barrier system. Includes four bollard mounting brackets, sixteen screws, one post weldment bracket and four quick links. Sold by the foot. Please specify when ordering how many feet you require. Be sure to order more total feet than the opening to allow for some chain slack. 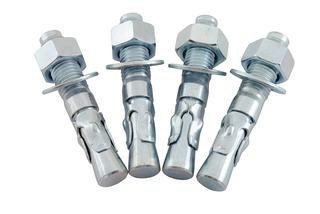 Optional Anchor Bolts Hardware for Concrete Installation also available – please see Options tab for details.